In a study published earlier this month Moody’s Investors Service became negative about Australian banks in light of their exposure to residential property. My analysis of Sydney property prices compared to other international cities suggests prices are getting up there but could run further. According to CoreLogic there has been increased activity in the Australian housing market in April and May 2016 following weaker market conditions in late 2015. This is code for taking more risk in lending. If we were to compare the cost of property in Sydney with other major cities in Australia, and around the world, we would find Sydney to be expensive. proportion of average income required to support a mortgage. The first measure looks at the multiple of average income to buy the property market. Sydney is at 11.34 times the average income. This is a pre-GFC levels seen in LA. Interestingly the two major cities either side of Sydney (Newcastle and Wollongong) are also expensive. If you’re having trouble understanding how someone can pay 88.03% of their income on their mortgage and be able to feed their families let me explain that this is a theoretical number. What this percentage is saying is that Sydney is essentially unaffordable for the average family – Numbeo.com uses mortgage costs for a 90 square meter apartment together with 1.5 times the average income as their base statistics. These statistics are gathered all over the world. To illustrate this point take the two most expensive cities in the world – London and New York – where only the rich & famous or foreign property owners can afford to buy property. In London the average person would spend 30.80 times their income to buy a property and would expense 212.67% of their income on the mortgage! Sydney feels a bit like London at the moment with strong demand from foreigners still driving the market together with a tight supply of stock. Interestingly Melbourne, Brisbane and Hobart are much ore affordable with multiples of 7-ish times and servicing costs of around 55% of income. 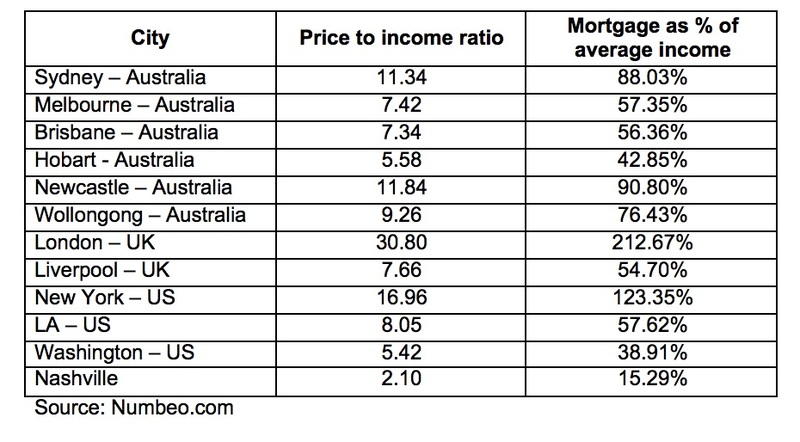 Perth (which I haven’t listed) has also returned to similar levels of affordability. As an aside we sold a one bedroom apartment on the lower north shore last week for a suburb record of more than $900,000. While pries may seem high there are plenty of buyers out there. We sold this in 3 days! So I’m not saying that Sydney property can’t or wont keep going up. Clearly the market has momentum. Add to this that other markets have risen to much higher prices than Sydney (London and New York are both international cities and Sydney is an emerging international city). What Moody’s are saying is that as a ratings agency of banking risk there are signs that make them less comfortable about tail risk – which is code for a market correction.